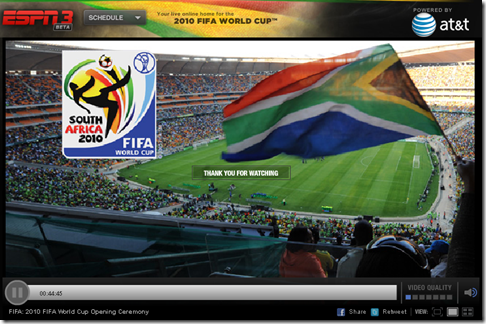 FIFA 2010 World Cup in South Africa is starting today. Some of us in the world unfortunately will be at work or away from home due to the timings of the matches. ESPN3 – Online streaming from the popular sports network in the US. ESPN3 will be streaming all 64 games. One thing to note is that you should either be watching from a list of ISPs they have deals with and you might have to use your ISP login before you could watch the live stream. For eg. I had to login with my AT&T U-Verse account to start watching. CBC Sports – Canada’s national public broadcaster is streaming all world cup matches online. BBC Sports – All matches will be available to watch live online in high quality video. Optus – Australian telecommunications carrier will be live streaming 2010 football matches for free to their customers with compatible 3G mobile devices. iTV – Will have select content from all 64 games and will live stream whole matches that iTV carries in UK. TVU Networks – TVU is a live streaming Intenet TV platform and is known for it’s live tv streams from around the world. You can get some more info here. Facebook – Posted a guide to the World Cup. They have some official broadcast partners that enable users to share updates while you watch the games online live. You can check out partners by country listed in the blog post and here. Also, TechCrunch has posted a Ultimate Guide to Digital Delight with a cornucopia of information on 2010 FIFA World Cup. Check it out. Do you know of any other live streams? Leave a comment and we will add it to the list here.